Every woman deserves to feel beautiful, and NJ boudoir photographer and entrepreneur Vernesa (pronounced Ver - NEE- sah) has a passion for celebrating the beauty that all women possess. Vernesa* created Velvet Rope Boudoir as a company built on confidence, inner strength, and self love. Here are 7 Questions with Vernesa about her business journey, her clientele, and why boudoir photography can be a liberating experience! 1. What is Velvet Rope Boudoir? Velvet Rope Boudoir is intimate portraiture of women. My mission is to allow women to embrace their womanhood. I specialize in boudoir and glamour photography. 2. 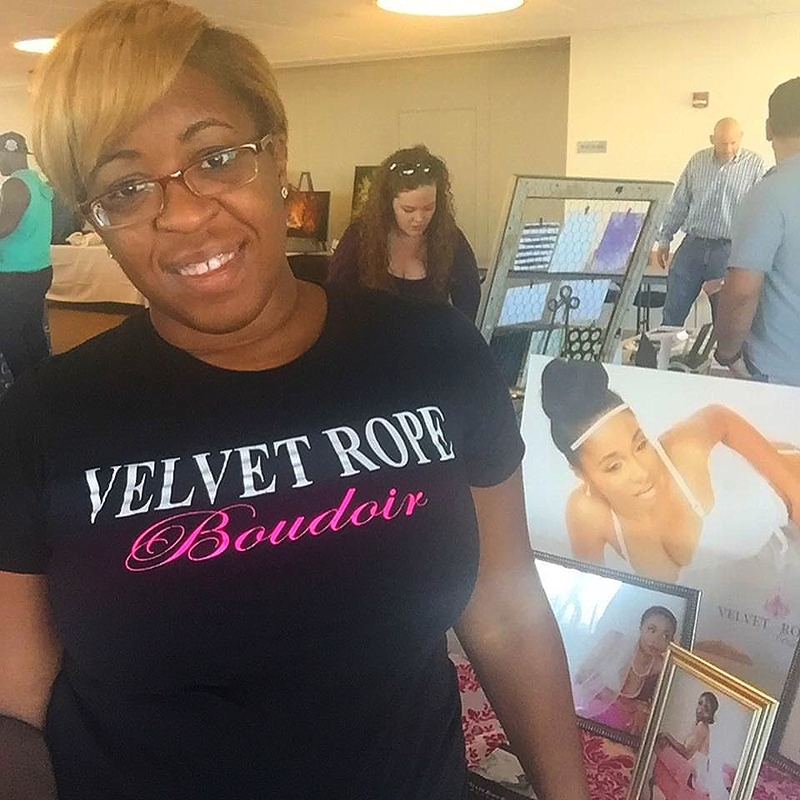 What made you start Velvet Rope Boudoir? What made me start Velvet Rope Boudoir was that I fell in love with beauty and the message boudoir photography portrays. I came to photography by accident. Five years ago, my family modeled for a friend who was building her portfolio and I left that experience thinking “I can do that! But I would have to find genre that speaks to me”. So as soon as I got home, I jumped on the computer and began looking at different types of photography, searching cameras and other equipment, checking the market for it, etc. I found Boudoir and instantly knew that this what I'm going to do! Women NEED this! It's all so beautiful and promotes self esteem and confidence... women NEED more of this. I wanted to use this to leave a mark and build my legacy. 3. What have been the advantages/disadvantages of being an entrepreneur? Being a photographer in a world where everyone is a “photographer” is tough. I struggle with proving my worth. I struggle with spreading the word on a minuscule budget. I struggle with staying true to my goal and vision. There are people who don't see the grand potential of my business in this genre especially when there's so many other types that will generate quick business. Since this is my business, I can work it and build it and change it however I see fit. Heck, half the time I don't know what I'm doing! But every moment is a learning experience and I get so excited when I begin to witness some fruits of my labor. I'm so proud and want to continue. 4. Why is Boudoir Photography a good idea for women to try? Women should experience Boudoir because it can be liberating, it can be confirmation, but mostly because it's fun! With Velvet Rope Boudoir, I create an experience that is supportive all the way from the moment you see my posts. I'm inviting, down to earth, and energetic like a friend would be. Usually I get a woman who is comfortable in her skin. She is a grown, independent woman with her life together. She's got a great job, she keeps herself well and she doesn't mind doing new things - she doesn't require permission or approval. At times, a woman who strives to be like that will come. In both cases, she will rock the shoot! I guide them along the way, including doing the poses myself for visual assistance. I will get to know her, I'm sharing things about me, listening and singing to the music... it's fun. Whether she comes to make a gift for her beau or just want to get pics for herself, the experience is the same and so worth it. The best part is being able to view your images that same day! I even show them within the shoot which helps a lot with nerves because no one ever realized how amazing they can look in photos. 5. What has been your best creative experience since starting Velvet Rope Boudoir? Every session I do is the best! That's because I always strive to do my best to bring out her best. As long as she is smiling, I have accomplished a goal. If I don't make any money, then I'm thinking about what could I have done differently. Everything is a learning opportunity. My favorite products are the photo albums because they showcase all of my work in a classy, sophisticated style. I want her to have all her photos and be something she wants to show off! 6. What are your 2016 plans for Velvet Rope Boudoir? For 2016, my plans are to get consistent bookings to benefit more women. I eventually want to move in to my own studio (right now I shoot in my home). I'd also like to hire a staff at some point. I want to be seen, heard, appreciated, booked and congratulated! I pray for growth and enlarged territory. 7. What piece of advice do you give women who are thinking about starting their own business? 1. Stay true to yourself. Do what makes you happy, but don't think it won't be hard. 2. Stick to it. Even if you have to break, rest and regroup. Cry, yell, kick and scream but don't quit. 3. When you find your rhythm, don't stop dancing. (I just made that one up!) Basically, when you find what works repeat the hell out of it!